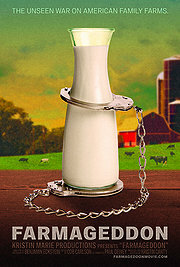 Eating Ethically: A Self-Imposed Guilt Trip. I’m afraid I am slowly becoming a crazy food person. The more I know, the more I don’t want to know. Ignorance is bliss when it comes to what we eat. For example, I’m probably going to hit up a local burrito place for lunch, I don’t really have any idea where their sources are from, they probably aren’t ethical, but I’m still going to eat there because I’m hungry, I don’t REALLY know, and they’re a local(ish) business. Rationalization: Complete. Farmageddon was really fascinating to me, and boosted my libertarian sentiments. In my mind I thought that the government should be working on making healthy food more affordable and nixing unhealthy foods (that is, the government controlling what we eat, but in a good way). Unfortunately, the government does control what we eat, but it’s in a bad way, and this has led to the sad demise of some local and family farms. I realized the ridiculousness of the situation when a woman who can’t get raw milk in her state said, “I can smoke and drink all I want while I’m pregnant, but I can’t have raw milk?! ?” Our priorities are definitely mixed up. I also had no idea how difficult it can be to have a farm. It seems very wrong. It almost seems like if the FDA and/or USDA could they would prevent people from eating anything directly from the ground or from the animal. Ummm… What? The film may be a little biased, but even so, it is sad. People ought to have the freedom to have farms, raise food and animals, sell said products, and people should have the freedom to buy and consume said products. But, we don’t. Affordability. Another excuse/rationale. Yes, it’s expensive, but so are your eating out and drinking habits. I am reasonably sure the majority of my peers: grad students and young-ish professionals-ish (i.e. employed) can afford to eat local/healthy/ethically. Again, we trade one portion of our spending for another. I’m not ADDING ethical food to my diet. I’m replacing all my unethical food for ethical food. What is ethical? It’s a bit late in the post, but, I don’t know. I never took a class. But it should at least be not impinging on another places food sources to the point of starvation, price hikes, decreased nutrition, etc etc. As far as meat production goes, it probably shouldn’t be super unnatural and gross (I really don’t wanna know). And you should probably give money/food to the hungry. Guilt trip over. What’s a girl to do? Author PaigePosted on January 17, 2013 January 17, 2013 Categories Asceticism, Creativity, MoviesTags diet, eating, eating local, farmageddon, farming, fda, food, health, money, movie review, quinoa, usda, vegetablesLeave a comment on Eating Ethically: A Self-Imposed Guilt Trip. Movie review: Eat. Pray. Love. The scenery was nice, the music was pretty good, and the presentation of the food in Italy makes you hungry. Julia Roberts looks like a normal sized woman. Also, a nice moral in the end is that you have to love others to love yourself, and love yourself to love others. I haven’t read the book, but this is like a SUPER CHICK FLICK. Three Romances in 4 awesome locations (New York, Italy, India, and Bali). For me, it was a little too romancey filled with unnecessary close-ups, and a lot of boring dialogue that makes you feel the time. Again, since I didn’t read the book, I didn’t know what to expect. But here is what I expected: more beautiful scenery, more senses, smells, textures, that would make me feel like I was in each spectacular location. Maybe a little bit more inspiration and less dramatic love stories. I had no idea how spirituality might be shown in the movie, and it was ok, trying to be all-inclusive, but sort of fell flat. I just didn’t feel it, but I have to give props for a movie trying, its not easy to convey on screen. Author PaigePosted on August 23, 2010 August 23, 2010 Categories MoviesTags movie review eat. pray. love.Leave a comment on Movie review: Eat. Pray. Love. It was amazing to see where all the food comes from, and how it gets to where it gets, and all the engineering, and all the cutting of corners, and all the people not being paid enough, and all of the debt, and all of the crappiness about this industry that essentially keeps us alive (and literally preserves us). Then after I was educated, I grilled and ate my evil dinner. The food that was covered in the movie was beef, chicken, pork, corn, and soybeans. Apparently, these are the foods that have become the easiest to mass produce and highest demand (thank you McDonalds). They didn’t even cover fruits, veggies, and fish! to be honest, I am kind of afraid to know how all the produce gets to me year round, that would probably make me feel guilty too… Food Inc. controversy was less about the food and more about the people. The people making the product are not being taken care of in addition to the product not being good for the consumer. So is this drastically going to change my diet? No, but it did make me fantasize more about running away to sustainable hippie commune.